Rebuking its own staff’s misinformation campaign, the Dallas City Council’s seven-member Quality of Life Committee voted unanimously at its Monday morning meeting to recommend joining the North Texas Clean Air Network. 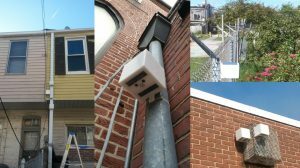 But in an unusual move, staff requested and received an almost three-month delay in scheduling a full city council vote on endorsing the new local air monitoring system. It won’t be until December 5th when the entire council gets briefed on the Network, and December 12th when they actually vote on whether to join. That’s a very long gestation period for a measure that just passed in Committee 7-0. Staff claimed they wanted the long pause because of what they said were questions about how the city would participate in the Network and what provisions were necessary to get access to monitor locations like….utility poles. Citizens might be forgiven for suspecting the real reason for the three-month delay is to give staff time to find some new “fatal flaw” in the network and scuttle the whole thing before it ever comes up for a vote. If one listened hard enough, you could hear the startled disbelief in staff’s comments when the yes vote came down, despite every outward sign pointing to that outcome. When one considers there was a Dallas city staffer at just about every meeting that led up to the creation of the Network, that these meetings began over a year ago, and that this specific presentation and vote has been scheduled for the Council’s review since August, it’s really quite incredible that staff admits they’ve spent no time thinking about how to implement this proposed policy within the city limits. Maybe because they’ve spent so much time trying to shoot it down. That’s because that’s not what air pollution sensors or monitors do. None of them. Nada. Zero. Not even the really big and expensive ones the City currently operates for the State and EPA. They can only measure what levels of PM pollution are in the air you’re breathing, not what cancers, birth defects, strokes, heart attacks, diabetes problems, IQ loss, dementia or other illnesses that PM Pollution are causing “in real time” in your body as you breathe it in. No such Star-Trek-like technology exists. In the real world researchers take the PM measurements recorded by sensors and correlate them to rates of illness. It’s a branch of science called epidemiology. The staff memo manages to completely confuse two wildly different scientific methods in a stunning, head-shaking way. It’d be flat-earth funny if it wasn’t, you know, the official position of Dallas City staff on the subject. Then it just becomes embarrassing. But whatever doubts about the Network staff tried to infect the council members with, they seemed to vanish once UTD Physics Professor Dr. David Lary and Downwinders’ Jim Schermbeck, representing the DFW Air Research Consortium, gave their 35-minute presentation on the Network. A roomful of “Clean Air Now” button-wearing supporters also helped the cause considerably. Thanks to everyone who came on an early Monday morning to make sure the Committee did the right thing. 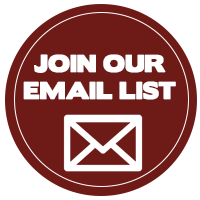 Thanks also to everyone who sent in emails to the Committee via our prepared Citizen Action website feature. That combination of grassroots support plus technical expertise is one of the things that’s so impressive about this bottom-up approach, and it paid off again in the Committee meeting. Schermbeck made the case for change, Lary gave the details of how to build that change, monitor by monitor. D Magazine published an online piece Monday morning that provides a point-by-point rationale for why this Network is A Big Idea Whose Time Has Come. Basically Big, Expensive and Slow has been replaced with Small, Cheap and Fast and it’s democratizing air quality information. All of that was included in the Committee presentation, plus examples of how it could have made a difference in the real world during a past crisis like the Sunshine Recycling Fire of December last year in West Dallas. Both Plano and Dallas County officials have already said they’re onboard with the Network and may act to ratify the founding documents in their jurisdiction before the scheduled December Dallas vote. By the end of the year a new 21st Century regional air monitoring system, driven by local expertise, controlled by local governments, and designed to promote public health could become a reality. But citizens may still have to fight to see it happen. In an ironic twist, the same staff that has been opposing the idea of Dallas joining the Network is now in charge of writing the briefing paper for the Council to explain why it’s a good idea. Bets are already being taken on how well they succeed. ARC’s Network presentation was only half of an interesting compare and contrast exercise looking at two local projects using air sensors in two very different ways that Chair Sandy Greyson had arranged for the Committee. The other half was a presentation by the Texas Nature Conservancy outlining their city staff-supported “resiliency” (i.e. 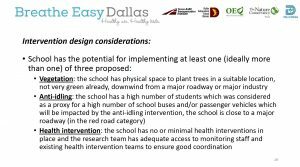 Rockefeller) project, the “Breathe Easy” study proposing to place a PM and ozone monitor for two years at nine DISD schools that already see high student asthma and absenteeism rates, all below Interstate 30. Breathe Easy has already started spending money and needed no vote…although it was the first time any Council Committee had been briefed on it. The study was supposed to get started back in August with the beginning of the school year but the nine schools haven’t been announced yet and so no monitors have been installed. Since the 2018-19 academic year is designed to provide a “baseline” of student asthma health, the study has already missed its chance of getting any data during the worst summer for ozone pollution in five years. It could take another month or longer to name the schools and wire-up the monitors. It’s uncertain how much this gap of missing information diminishes the value or definition of a baseline to which three specific intervention efforts are to be measured against beginning in the 2019-20 academic year. Those intervention efforts include vehicle idling policies at or near schools, screens of vegetation between the street and school, and in-school asthma therapies. The question being posed by the study is whether these intervention efforts have any impact on school-site pollution levels and therefore student asthma or absenteeism rates that can be measured. There’s certainly no harm in doing this study, but… its about ten years behind the times and spends a lot of money to tell us what we already know. For example, we know DFW children’s asthma levels are higher than the national average. In their presentation, the TNC uses the 2009 Cook’s Children’s Hospital study made infamous by Downwinders almost a decade ago. That study contains the map showing a huge diagonal swath of childhood asthma running the length of Tarrant County that almost exactly syncs-up with the prevailing pollution plumes from the three Midlothian cement plants. Downwinders used that map time and again to prove the impact of the cement plants on downwind health during our Green Cement Campaign. We know asthma is worse in minority communities. Many green groups were speaking out about this fact during the first wave of Environmental Justice activism during the 1990’s and have never stopped. What’s interesting is that TNC and the staff never ever talk about WHY this is a fact. It’s like they consider it an inherent genetic defect. One reason might be that the Dallas City Hall staff now feigning concern for sick black kids is the same crew responsible for actively pressing racist zoning and land use planning in black and brown neighborhoods, like their predecessors before them. 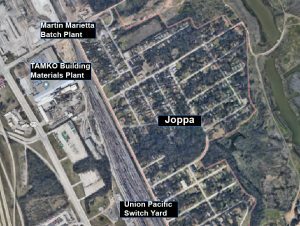 It was only last March when they were recommending approval for those two new batch plants in Joppa. Only last February when they recommended the Ash Grove Cement Silo in West Dallas. Before that they approved the move of the Argos batch plant from trendy Trinity Groves to a location next to a school in West Dallas. 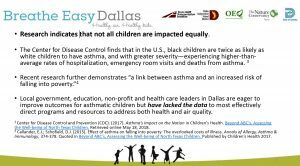 Why do black kids have higher asthma rates in Dallas? Perhaps because the City of Dallas has designed it that way for over a century. There is not a single note of contrition about this contradiction in the TNC or staff’s presentation on its Breathe Easy project. No “we’re sorry for putting people and polluters way too close in minority neighborhoods.” No “we’re going to do better from here on out – not just with these studies, but with actual policy.” No change in behavior, or even why there might need to be one, is ever discussed. 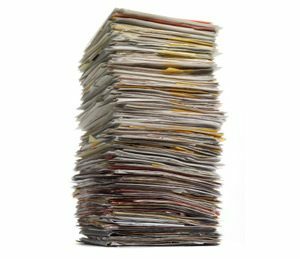 Those supporting the Breathe Easy study – or any other collaboration with the the Office of Environmental Quality and Rockefeller Sustainability – should understand they’re aligning themselves with a bureaucracy that’s been at the forefront of making the pollution problems in Joppa and West Dallas worse. And now the same bureaucracy wants to “study” the problem they helped make by testing out three piecemeal approaches to reducing exposure, rather than looking at how institutional changes could bring more fundamental and lasting solutions. In the end, a year of intervention strategies at your school does little lasting good if you walk home through a polluted neighborhood whose industries have been given a blank check by city staff. We know reducing exposure to PM pollution improves your health. Lots and lots of studies show that. We know which specific strategies work to reduce PM pollution. Buffer zones, vegetation screens, inside air filters, pollution controls, electrification of vehicles – all of these have been examined by researchers and found to reduce PM pollution levels. Even the Nature Conservancy cites the empirical success of tree planting in reducing pollution based on a past study. We don’t need a new study to tell us these strategies are effective. We need more money to implement them. What the Breath Easy study seems to want to acquire is a new number – A, B and C intervention strategies reduce student asthma attacks/absenteeism by X, Y and Z amounts. But can that be a meaningful, scientifically-robust number now that you only have an abbreviated baseline that excludes summer? Can it be meaningful if you only spend a year testing intervention strategies, including growing vegetation screens? Even applying copious amounts of Miracle Gro, your trees are not going to get that tall in 12 months. Using all of TNC’s own data, a convincing case can be made that the $300,000 + being spent on this study could have been better spent on buying trees for those nine schools and installing them as PM screens. But that would have just reduced PM pollution. It wouldn’t have produced a study for the Rockefeller Foundation. 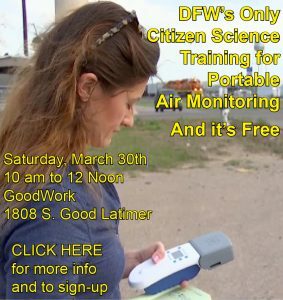 A dense regional Network of air monitors will begin to expose the deep disparities in pollution burdens in Dallas and elsewhere. 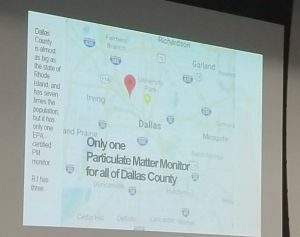 It’ll provide a map to black and brown neighborhoods they don’t have now, providing further evidence that what you breathe in Dallas depends on where you live in Dallas. There’s plenty of indications this is the real disparity that Dallas City Hall staff are concerned with – even more than higher rates of black childhood asthma. The curtains are about to part and provide a much clearer picture of how Dallas’ institutional racism has poisoned its own residents. It behooves everyone who calls themselves an environmentalist in Dallas in 2018 to commit to changing that picture, not just studying it.